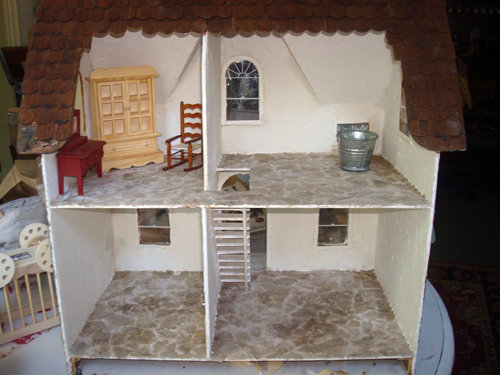 This morning I've been making dollhouse kit furniture with Big D. It's all a big ugly but that's ok because it'll be going in the abandoned house. Inside, the floors have been worked on a bit more and the walls have been given a thin layer of messy plaster. The walls will probably have stains and potion splatter eventually. At this point I start shoving things inside to see if they fit and to wrap my head around what will be going where and to generate ideas. 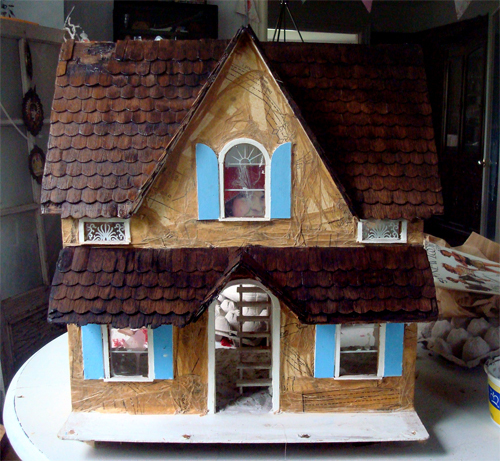 I covered the exterior of the house in a layer of sewing paper tissue. I really like the look that it gives... a sort of wrinkly, crinkly skin. When that set I applied layers of paint and wiped them off to gunge up the joint. This will be refined as I continue to work on the place. 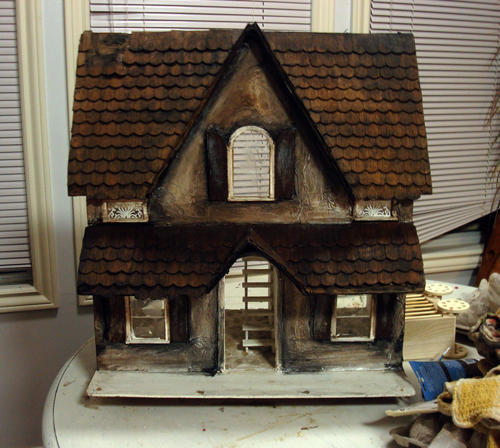 It's coming along quite spookily! Looks like it is coming along fabulously! I love the outside, was a bit taken aback between the bright blue shutter photo and the next, but wow you so know what you are doing. Yes, the blue shutters were a brief shock, weren't they? Oooohhhh! The outside is looking spooky and abandoned. Oh this is going to be so cool!! I can see that it has amazingly spooky potential. What a fun project!! !